Made with jojoba, shea butter, organic apple, lemon and grape juices,vitamin C, essential fatty acids and peptides, this silky lotion smells as good as it sounds. Just the right thickness and good for the whole body, this is a great after-shower all-over lotion. 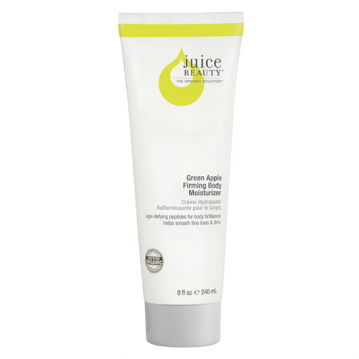 Green Apple Age Defy Moisturizer: $45 US (2 fl oz.) This one feels amazing the minute you put it on. it’s light and fragrant and completely guilt free. made with “certified organic juices, with an antioxidant cocktail of alpha lipoic acid, Co Q10, Vitamin C, peptides and DMAE”, to keep you looking younger longer. Cleansing Milk: $22US (6.75 fl oz.) The perfect start and finish to your day. Although it might not be the best for removing heavy makeup, this creamy cleanser feels soft and refreshing as it gently removes impurities without drying out your skin. the combination of organic grape seed and sunflower oils, and organic chamomile and calendula make this product hard not to instantly love. The best part? Their motto, “Powerful Action Without… Our formulations are made without parabens, petroleum, propylene or butylene glycol, sodium lauryl sulfates, pesticides, phthalates, artificial dyes or synthetic fragrances. Our products are never tested on animals.” Touché.